The first Carbon Offset Project (C-Offset) for Samoa wrapped up its pilot phase in the villages of Poutasi, Saleilua and Sa’aga on Upolu on Friday October 21. Initiated by the Samoa Conservation Society in partnership with the Ministry of Natural Resources and Environment (MNRE) the Project piloted activities to offset carbon emissions from the transport sector, with a focus on air travel. This project supports the priorities given by the government to improve environmental sustainability, mitigate climate change and improve disaster resilience while at the same time contributing to the livelihoods of our communities. James Atherton, the Project Team Leader says the concept of the project is very simple. “All fossil-fuel powered vehicles including commercial airplanes emit CO2 during operation. If you wanted to be “Carbon Neutral” you could then pay a carbon offset, in a sense you are paying for the emissions you are contributing to. Your payment would then be used in a project meant to reduce or sequester greenhouse gas emissions.” Many airlines now have a “carbon offset” option when you book your flight. According to Atherton, because climate change is a non-localized problem, it doesn’t matter where the emissions are reduced. Greenhouse gases spread evenly throughout the atmosphere and reducing them anywhere contributes to protecting the climate. The same method can be used to offset the annual mileage accumulated by an automobile, or the emissions of a stationary source such as a power plant or even office power usage. The C-Offset pilot phase began initial activities earlier this year funded by the carbon offset payments of three local donors to start the planting of over 600 trees at the O Le Pupu Pue National Park (OLPP NP) to offset the international flights of the donors since the beginning of 2015. “Our target was 500 trees to offset 100,000 kg CO2 but we ended up planting 620 native trees. Once these trees reach maturity they will have absorbed over 140,000 kg CO2 from the atmosphere. 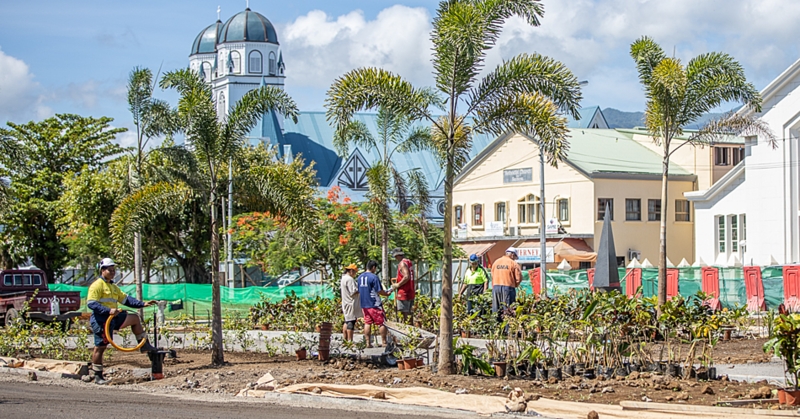 So not only will Samoa’s new C-Offset project help people to offset their carbon pollution, it will also help restore our degraded forests and improve biodiversity in general, own up to our responsibilities, and involve communities through youth engagement,” said Atherton. 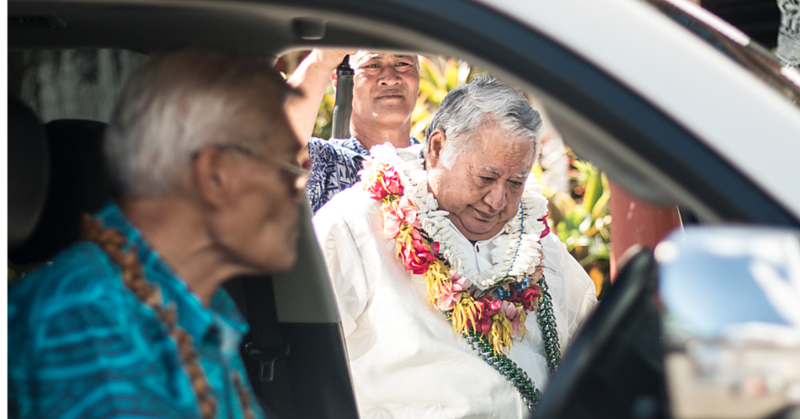 The initial phase of the project was implemented through the villages of Poutasi, Saleilua and Saaga. Staff from the Society and MNRE are working with young people and members of the community to replant and maintain areas replanted under C-Offset. “The Sui-o-le-Malo (Village Mayors) and nine young people from the three project villages were given a thorough briefing on the elements of the project including what causes climate change, the roles of forest as carbon sinks, the impacts of invasive species on Samoa’s forest as well as trained in practical forest restoration skills” said Moeumu Uili of MNRE’s Forestry Division. “We also had a very successful public open day when 17 people planted 150 trees to support the project at OLPP NP” said Uili. 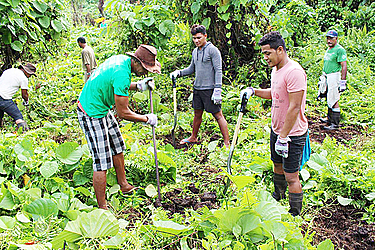 “We were particularly happy that staff from the nearby Sinalei Reef Resort joined us in the tree planting efforts and are pledging to offset their carbon emissions as part of a “Greening Sinalei” initiative they are undertaking,” added Uili. Forests in Samoa as in the Pacific continue to decline as a result of various threats including logging, agricultural activity, the spread of invasive species and extreme weather events, especially cyclones. Samoa’s forest cover has gone down from around 75% in the 1950’s to less than 60% today. Some experts believe that a quarter of the remaining forest is highly degraded and dominated by invasive plants such as fa’apasi (African Tulip), tamaligi (Albizzia), pulu vao (African rubber), and pulu mamoe (Panama rubber).